Corolla is more than the sum of its parts – combining Toyota’s legendary reputation for quality, durability and reliability with stylish looks, sophisticated features and a fun-to-drive personality. All Corollas are built around a powerful and efficient 1.8-litre four-cylinder engine mated to a responsive six-speed manual, a sophisticated four-speed automatic, or an advanced Intelligent Shift CVTi-S. With a suspension that has been designed to maximize handling and reduce vibration, you can be sure that the Corolla is fun to drive. Corolla’s styling is bold and expressive, with sleek sculpting to give this compact a sleek drag co-efficient of just 0.28. 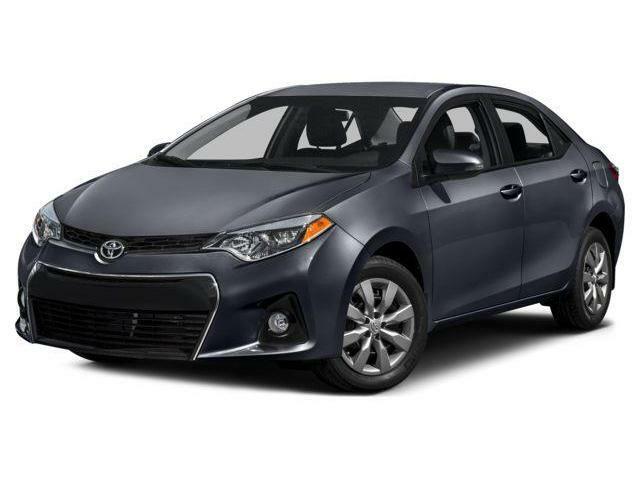 Inside, the Corolla expresses craftsmanship with a stylish, and functional cabin displaying attention to detail not typically found in its segment. Ornamental stitching, pinstriped accents and piano black gloss trim with metallic touches convey an upscale, sporty image. Thoughtfully designed and engineered front seats offer plenty of support for those up front, while maximizing room for those riding in the back. The 2016 Corolla makes an immediate impression, with LED headlamps standard on all models. Other standard features include audio systems with USB and Bluetooth connectivity, steering wheel-mounted audio controls, power windows and door locks, the versatility of a 60/40 split fold-down rear seat, power adjustable, colour-keyed and heated side mirrors, and a full complement of active and passive safety systems,including the six active technologies in the Toyota Star Safety System. All this, plus the Corolla’s Canadian-built reputation for legendary quality, durability and reliability –makes Corolla not only easy to love, but also easy to justify. The Corolla CE is offered with a choice of automatic transmission and an surprising list of standard features typically found on class-up vehicles – including power door locks, power windows with driver auto up/down, dual vanity mirrors, remote trunk release, and a 12-volt accessory power outlet to name a few. The Corolla LE has a continuously variable transmission with intelligent shift for inspired performance and efficiency, plus an enviable list of standard features – including 6.1” touch-screen Display Audio(video), 6 speakers, voice recognition, an ECO driving indicator, air conditioning, back-up camera, heated front seats, a fold-down rear-seat armrest, cruise control, automatic headlamps and more. Sporty and stylish, the Corolla S offers spry performance, advanced technology, and a premium interior. Whether equipped with a six-speed manual or a CVTi-S with paddle shifters, every Corolla S is loaded with S-exclusive features – including sport seats with sport fabric, a sport speedometer, sport front fascia, a rear spoiler and more. Additional standard features include heated front seats, chrome exhaust tip, rear lip spoiler, fog lamps, 6.1” Display Audio, 3.5” multi-information display, leather-wrapped steering wheel, a fold-down rear-seat armrest, and more. The Corolla LE ECO features a special 1.8-litre four-cylinder engine with VALVEMATIC technology, matched to the efficient and advanced CVTi-S. Low-resistance tires and other features boost efficiency, giving this Corolla a remarkable fuel efficiency of 6.8L per 100 kilometers (city/highway combined). An extensive list of standard features includes 6.1” touch-screen Display Audio, automatic air conditioning, ECO driving indicator, a rear lip spoiler, back-up camera, heated front seats, a fold-down rear-seat armrest, and more.